Traders attempt to isolate and extract profit from trends. There are multiple ways to do this. No single indicator will punch your ticket to market riches, as trading involves other factors such as risk management and trading psychology as well. But certain indicators have stood the test of time and remain popular amongst trend traders. Here we provide general guidelines and prospective strategies are provided for each; use these or tweak them to create your own personal strategy. Moving averages “smooth” price data by creating a single flowing line. The line represents the average price over a period of time. Which moving average the trader decides to use is determined by the time frame on which he/she trades. For investors and long-term trend followers, the 200-day, 100-day and 50-day simple moving average are popular choices. There are several ways to utilize the moving average. The first is to look at the angle of the moving average. If it is mostly moving horizontally for an extended amount of time, then the price isn’t trending, it is ranging. If it is angled up, an uptrend is underway. Moving averages don’t predict though; they simply show what the price is doing on average over a period of time. Crossovers are another way to utilize moving averages. By plotting both a 200-day and 50-day moving average on your chart, a buy signal occurs when the 50-day crosses above the 200-day. A sell signal occurs when the 50-day drops below the 200-day. The time frames can be altered to suit your individual trading time frame. When the price crosses above a moving average, it can also be used as a buy signal, and when the price crosses below a moving average, it can be used as a sell signal. Since price is more volatile than the moving average, this method is prone to more false signals, as the chart above shows. Moving averages can also provide support or resistance to the price. The chart below shows a 100-day moving average acting as support (price bounces off of it). 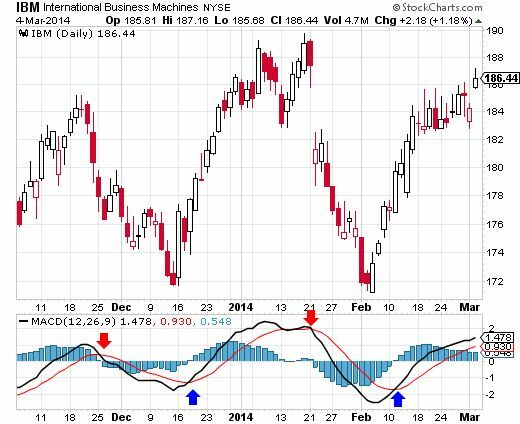 The MACD is an oscillating indicator, fluctuating above and below zero. 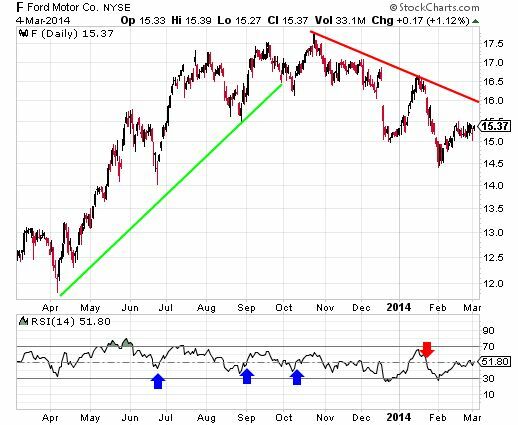 It is both a trend following and momentum indicator. One basic MACD strategy is to look at which side of zero the MACD lines are on. Above zero for a sustained period of time and the trend is likely up; below zero for a sustained period of time and the trend is likely down. Potential buy signals occur when the MACD moves above zero, and potential sell signals when it crosses below zero. Signal line crossovers provide additional buy and sell signals. A MACD has two lines–a fast line and a slow line. A buy signal occurs when the fast line crosses through and above the slow line. A sell signal occurs when the fast line crosses through and below the slow line. The RSI is another oscillator, but because its movement is contained between zero and 100, it provides some different information than the MACD. One way to interpret the RSI is by viewing the price as “overbought” – and due for a correction – when the indicator is above 70, and the price as oversold – and due for a bounce – when the indicator is below 30. In a strong uptrend, the price will often reach 70 and beyond for sustained periods, and downtrends can stay at 30 or below for a long time. While general overbought and oversold levels can be accurate occasionally, they may not provide the most timely signals for trend traders. An alternative is to buy near oversold conditions when the trend is up, and take short trades near overbought conditions in a downtrend. Say the long-term trend of a stock is up. 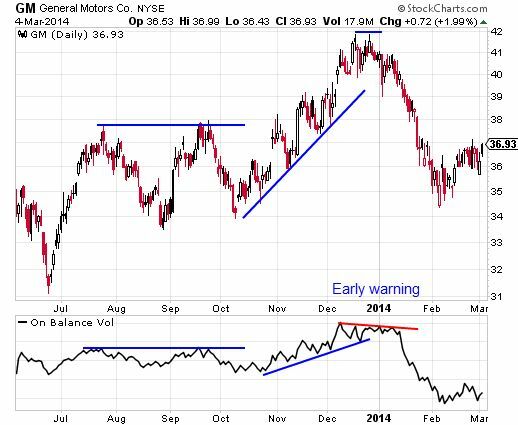 A buy signal occurs when the RSI moves below 50 and then back above it. Essentially this means a pullback in price has occurred, and the trader is buying once the pullback appears to have ended (according to the RSI) and the trend is resuming. 50 is used because the RSI doesn’t typically reach 30 in an uptrend unless a potential reversal is underway. A short-trade signal occurs when the trend is down and the RSI moves above 50 and then back below it. Trendlines or a moving average can help establish the trend direction, and in which direction to take trade signals. Volume itself is a valuable indicator, and OBV takes a lot volume information and compiles it into a signal one-line indicator. The indicator measures cumulative buying/selling pressure by adding the volume on up days and subtracting volume on losing days. Ideally, volume should confirm trends. A rising price should be accompanied by a rising OBV; a falling price should be accompanied by a falling OBV. 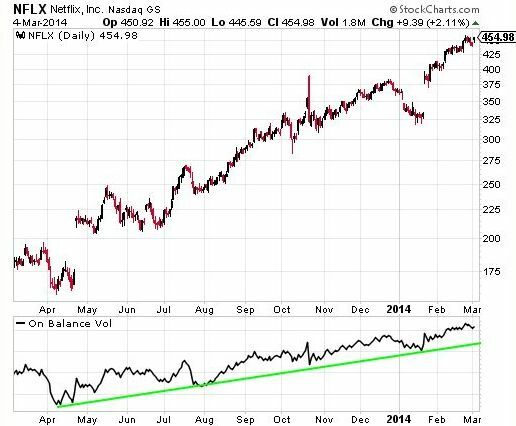 The figure below shows shares for the Los Gatos, Calif.-based Netflix Inc.(Nasdaq:NFLX) trending higher along with OBV. Since OBV didn’t drop below its trendline, it was a good indication that the price was likely to continue trending higher after the pullbacks. If OBV is rising and price isn’t, price is likely to follow the OBV and start rising. If price is rising and OBV is flat-lining or falling, the price may be near a top. If the price is falling and OBV is flat-lining or rising, the price could be nearing a bottom. Indicators can simplify price information, as well as provide trend trade signals or warn of reversals. Indicators can be used on all time frames, and have variables that can be adjusted to suit each traders specific preferences. Combine indicator strategies, or come up with your own guidelines, so entry and exit criteria are clearly established for trades. Each indicator can be used in more ways than outlined. If you like an indicator research it further, and most of all personally test it out before using it to make live trades. 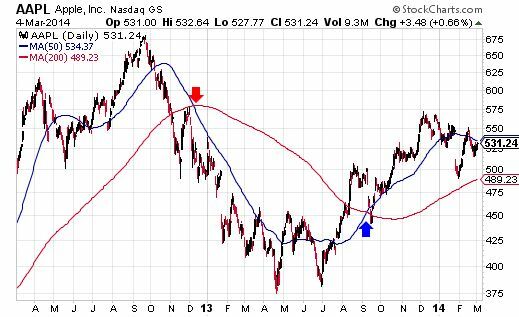 "Moving averages can also provide support or resistance to the price. 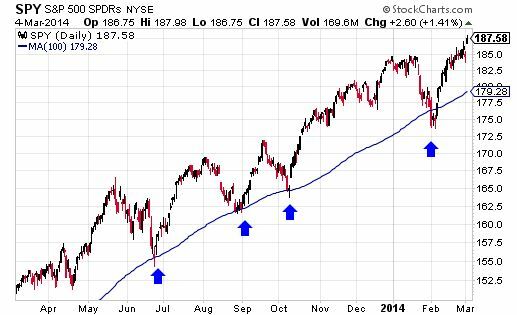 The chart below shows a 100-day moving average acting as support (price bounces off of it)." Oh dear oh dear - this ol' chestnut! It's a bit depressing that the myth of moving averages providing S&R is being perpetuated by someone who is a member of the Market Technicians Association and the Canadian Society of Technical Analysts. I'd concede that the one exception would be the 50MA, 100MA and 200MA on a daily chart (as in this example) as they are so widely viewed that it becomes self-fulfilling. However, on almost all other timeframes and all other MAs - it makes no sense at all for reasons covered in this post. The point is not whether MA work or do not work but that they are used extensively by trand traders and how they may be used when they do use them. One of the people you most revere in trading also uses them and whilst there is no logical reason why they may work the fact is that combined with other approaches they can provide an "indication" of whether a market is moving consistently in one direction or not in my view. No argument with anything you say here and, indeed, I've nothing against moving averages per se. On the contrary, I use them myself. It's simply the notion of a MA providing support and resistance that I'm questioning. Nothing more, nothing less. It's a great example for me of how the "old school" traders - and of course the MTA- are so out of touch - and no wonder algo's and bots have replaced them. Is it useful to use both MACD and MA? Since MACD is also based on MA, is it feasible to use it , alongside MAs?